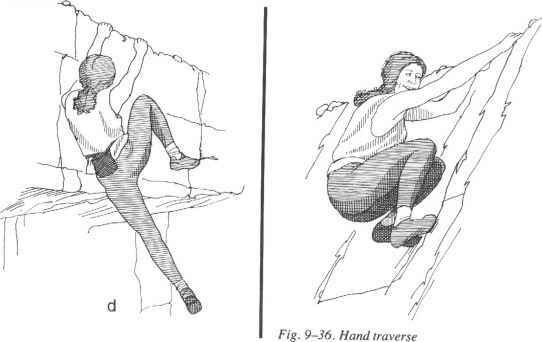 Traversing—going sideways across a section of rock instead of up or down—again calls for a catalog of climbing techniques (fig. 9-35). The main ones are side clings, liebacks, and stemming. And counterbalance is important when making a long sideways reach. 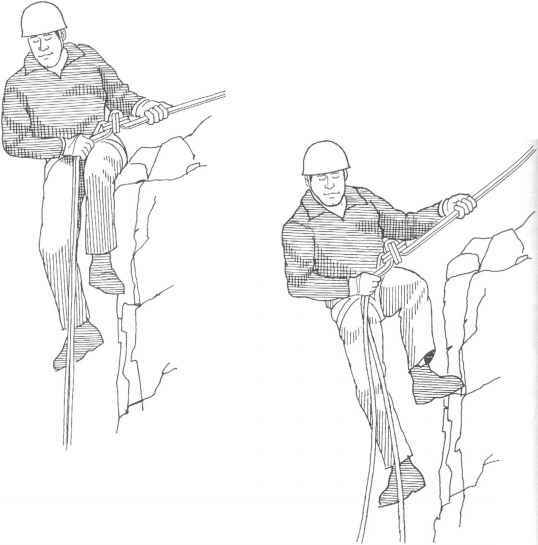 The climber usually faces into the rock, toes pointed away from each other. Hands and feet are commonly shuffled sideways, although exchanging one hand for the other, or one foot for the other, on a single hold can be very useful. 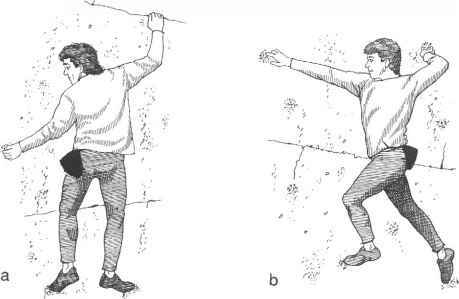 You may occasionally cross one foot behind the other to reach the next hold, or cross one hand over the other. On a steep pitch it's very tiring to hold yourself into the rock on bent arms. When possible, lean out from the rock on straight arms. This conserves arm strength, and it gives a better view of where you're going. Ff 9~35 Traversing a steep face: a, lieback with one hand, leaning out to reach another hold with the other hand; b, climber twists body to take long sideways reach—an advanced technique. 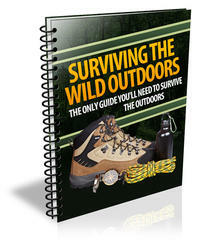 conserve arm strength and to let the legs do as much of the work as possible.